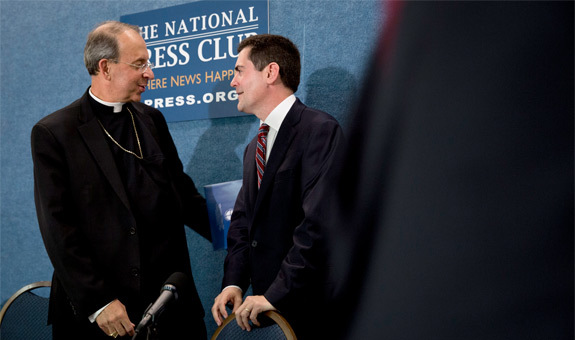 At a press conference in Washington on July 2, Russell Moore, president of the Southern Baptist Convention’s Ethics and Religious Liberty Commission, joined Archbishop William Lori of Baltimore, chairman of the United States Conference of Catholic Bishops’ Ad Hoc Committee for Religious Liberty, in releasing “Standing Together for Religious Freedom: An Open Letter to All Americans” (PDF file). In this landmark letter, Protestant, Catholic, Jewish, and other religious leaders, together with academics and heads of nonprofit agencies, warned Americans about the threats to religious liberty posed by the HHS mandate. At the press conference, Moore, Archbishop Lori, Anne Hendershott of Franciscan University of Steubenville, and Yuri Mantilla of Liberty University spoke out in defense of religious liberty (PDF file), as Dr. Hendershott reported on the CWR Blog. The objections to the mandate lodged by the U.S. bishops and Catholic organizations tend to be well known to Catholic readers, and some of the letters’ non-Catholic signatories, such as the Alliance Defending Freedom, have been among the leaders in the opposition to the mandate. CWR asked many of the other signatories associated with non-Catholic organizations, including non-Catholic religious leaders, why they signed the open letter. CWR also asked them what their organizations are doing to raise awareness about the dangers to religious liberty posed by the mandate. Here are their responses, in their own words. The HHS mandate to include contraceptives and abortifacients is wrong all by itself, but it also has far-reaching implications for restricting future religious freedom in America. If the government can order American citizens to purchase products and services for others which are religiously offensive, then the government can force almost anything. The United States was founded by immigrants fleeing European governments that controlled religious beliefs and practices. The very reason so many came to America was to escape this kind of government control. Hundreds of years later is not the time to return to medieval government restrictions on religious freedom. Over one-third of the Protestants signing the letter are members of the board of directors of the National Association of Evangelicals. In addition, the NAE has criticized the mandate in the press, to our constituency, and through multiple digital media. We are informing our members and encouraging them to call on the Department of Health and Human Services to end the mandate or allow robust rules for exemptions because of religious and moral objections to the mandate. Exemptions should be extended beyond churches to all citizens and business as a matter of religious freedom. I love, respect, and cherish freedoms in the United States of America. This 237 year-old American experiment in governance recognizes individual human rights as endowments from God, that religious freedom is a right instead of a measured dispensation from government. I am gravely concerned that our nation is abandoning this cornerstone of freedom. Government has now decreed people of religious conviction must violate their convictions in subservience to an agenda deemed to be of higher value. Whatever the specifics, when religious freedom is imperially trampled upon to enforce a policy, then an ill wind blows upon the future of all religious freedom. I am extremely disappointed with what appears to be an elitist hubris of the executive branch regarding religious freedom. It defies the foundational values and origin of our nation. Accordingly, I considered it my duty to sign the letter. I signed the letter because I agree broadly with its principles. I might add a concern that I have not seen raised in the debate and that the letter partially addresses, though not sufficiently, and that is that a state that is increasingly activist in more and more areas of social and family policy is bound to encroach on religious freedom, not simply by explicit “negative” prohibitions (where constitutional law is more likely to protect) but also by “positive” demands with authoritarian implications, and that this case is therefore likely to be only the beginning. As for Patrick Henry College, I cannot speak for PHC as an institution. I decided to sign the letter for two reasons. First, I am in agreement with the letter and the concerns expressed regarding what many of us believe are intentional anti-religious actions by the government. Second, as General Superintendent of the IPHC, I wanted to express our solidarity with other evangelical and pentecostal groups that are represented on the document. Pertaining to the second question, at this time the IPHC is not taking any other action related to the HHS mandate. We are concerned about it in relation to our own insurance policies at our headquarters, but other than general conversation, no other action has been taken. We have made public statements on our web page related to other pertinent issues facing the nation, i.e., homosexuality and marriage. We support the letter because we feel strongly that the HHS mandate is an infringement on the religious rights of our schools. Our schools should not be forced to offer something they believe is Biblically wrong. We have done webinars and articles in our newsletter to keep schools informed. My conviction as a believer in Jesus Christ is that we are to follow the Scriptures and use our resources to promote the sanctity of life. The HHS mandate violates this conviction. At our General Assembly (annual meeting of our denomination) in June 2012, we took a position opposing the HHS Preventative Care Mandate, which was communicated to the federal government and publicized within the EPC. Our action was consistent with our Position Paper on Abortion, which was originally approved in 1987. In addition, the EPC encouraged its national leadership to consider joining amicus curiae in support of those parties seeking protection of their religious liberties in the face of the imposition of requirements to provide for abortions and abortifacient drugs. The EPC joined an amicus in November, 2012. The actions that EPC national leadership has taken in the past year in response to the direction of the EPC in 2012 were reviewed and approved by the 2013 General Assembly, which met last month. Given the strong biblically-based positions the EPC has taken on abortion and homosexuality, I believe EPC churches are well aware of the dangers to religious liberty we face. We are ready to keep our leaders and members updated as developments occur. As Archbishop Lori noted in his comments, this group represents a wide range of faiths, not all of which are affected equally by the HHS mandate. The Church of Jesus Christ of Latter-day Saints agrees that the religious freedom implications of this legislation are significant and is happy to join with other faiths in expressing that view. The Standing Together for Religious Freedom letter is in line with our beliefs regarding the value of human life and we chose to sign on to it in light of our religious freedom, so we might seek to express our conscience on these matters that are deeply held among Wesleyans. We are continuing to stand in solidarity for religious freedom, and in particular with our educational institutions who have a right to defend against intrusions into their religious liberty expressed in freedom of conscience. I decided to sign the letter because I will always stand with my fellow citizens in support of religious freedom, and in support of all fundamental rights and freedoms, whenever any of them are under threat. No government should ever force individuals to do something that goes against his or her moral or ethical convictions, and that is what HHS is doing with its contraceptive coverage mandate. I am a co-chair and coordinator of the International Religious Freedom (IRF) Roundtable, which is an informal group of individuals from non-governmental organizations who gather regularly to discuss IRF issues on a non-attribution basis. It is simply a safe space where participants gather, speak freely in sharing ideas and information, and propose joint advocacy actions to address specific IRF issues and problems. In response to various participant-led initiatives regarding the protection and promotion of freedom of religion, conscience, and belief in the U.S. and abroad, all participants have the opportunity to self-select into coalitions of the willing. In coordination with the organizers of the letter, I sent the letter to the Roundtable and invited signatures. And many of the participants of the Roundtable signed on. I signed the letter, and beyond that I will see what the leaders of the effort organize. I will continue to stand with them on this, and help when I can. And I will continue to co-chair and coordinate the Roundtable and help to advance religious freedom in the U.S. and abroad. The goal of the Roundtable is to reverse the rising tide of restrictions on religious freedom that is spreading across the world –- 75 percent of the world’s approximately seven billion people now live in countries with high government restrictions on religion and/or high social hostilities involving religion, up from 70 percent just one year earlier ([according to the] Pew Forum on Religion & Public Life). The Christian Legal Society’s Center for Law & Religious Freedom has been dedicated to fighting for religious liberty for over 36 years. We have filed numerous briefs, which you can find on our website, in support of religious groups to be exempt from the HHS mandate. As to steps we have taken, other than filing in court, we speak and write articles in support of that same position. The narrowing of the religious exemption in the HHS Mandate and forcing religious individuals and organizations to violate their religious conscience is unprecedented and in direct conflict with the First Amendment. To silence faith is to silence the moral conscience of our nation. To obstruct religious liberty is to obstruct the forces that reconcile righteousness with justice; covenant with community, sanctification with service, and faith with action. To oppress religious freedom is to deny the prophetic while granting amnesty to the pathetic. The NHCLC will work with our 40,118 member churches to build a firewall against further intrusion while simultaneously engaging in prophetic activism by raising awareness regarding the rise of secular tyranny and encouraging our elected officials to protect our most cherished liberty. It is not some type of misunderstanding on his part, but a purposeful agenda. He talks of “freedom of worship,” but seems hostile to actual freedom of religion beyond the four walls of prayer in church. It is a deliberate attack, always hiding behind flowery language and cultural values he deems superior, which he hopes to impose on us all. It is his belief that he defines what is freedom or rights. While he has gone out of his way to protect and accommodate Islamic demands, he has gone out of his way to challenge and dismiss Christian religious precepts, basically prioritizing for the nation according to his transnational and radical beliefs. He is doing so in other areas as well, such as unilateral cuts in our ability to defend ourselves as well as in economic markets, forbidding all types of necessary endeavors in the energy sector while implementing government-sponsored business deals for his supporters; and he will soon control the health care choices of individuals. American presidents have historically been more humble toward the citizen and their right to pursue what is best for them as individuals. Religious people need to realize that religious freedom is dependent on economic freedom: both involve the liberty and soul of the individual. The state is not our Lord, neither religiously nor by redistributing individual earnings to those it prefers under false schemes of social justice. Mr. Obama is dangerously trampling on many of the sectors that constitute our lives, one at a time. He is totally at odds, sometimes at war, with our founding principles and historic traditions. 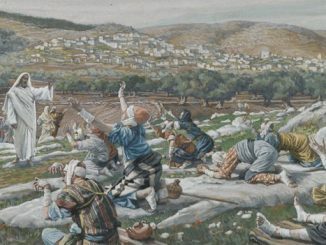 At stake is our Judeo-Christian heritage and national blessing. What God has joined together let no man tear asunder. We stand with other faiths in the protection of basic religious freedom principles and work towards ensuring that these rights are maintained and not eroded. The principles of religious freedom are incorporated in the Creed of the Church of Scientology as laid out by our Founder L. Ron Hubbard, and the laws of our land clearly state in the Constitution / Bill of Rights that government shall not dictate how a religion practices its faith. It is vital that all religions stand together on these basics principles and help guide government so as to ensure that each maintains not only its right to believe one’s faith but to practice it. The Church, working with other faiths on religious freedom issues both domestically and internationally, will continue to advocate for these basic beliefs and to be vigilant about erosion of our constitutional rights. We feel very strongly [about] these principles and that it is key to maintain these here at home to help set a good example for other countries and their efforts to uphold basic religious freedom principles. We will continue to brief not only our own members but to also work with others to bring light to this situation as well as any other violations of religious freedom.